So many factors. Battery needs care to maintain its chemistry and its energy efficiency. The aging process starts at the moment the battery leaves the manufacturing factory. 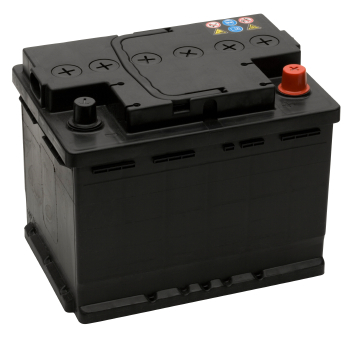 Self discharge ,sulphation, capacity loss, overcharging, dendrite growth, grid corrosion, excessive heat and water loss etc are some common reasons for the premature battery failure. If the battery is not cycling for long period, self discharge takes place @ 4 % per week at 27 degree. For example, a 125 Ah battery shows self discharge @ 5 Amps current per week if it is not discharging through the Inverter. Sulphation is another important factor affecting battery efficiency. The lead sulphate accumulating on the plates prevents charge release/ acceptance cycles. Usually the lead sulphate crystals will be removed during water filling and charging. So it is better to charge the battery as soon as possible to prevent sulphation. Another important reason is overcharging. The battery used in backup systems should have a charger cut off facility, otherwise the battery will get over charged due to float charging. When the battery is overcharged, the charge voltage increases above the Gassing voltage. This causes formation of excess hydrogen. The Gassing voltage of a 12 V lead acid battery is 14.3 at room temperature. The battery voltage crosses the gassing voltage level if one or more cells are damaged or weaker. The weaker cell will charge last since its resistance is lower than the good cells. So higher voltage appears across the good cells and may increase the voltage above the gassing voltage level. By using the battery equalization method, it is easy to make the battery fully charged. All the cells in the battery will not be equally good due to aging. Some cells accept charge very fast and some in a slow rate. If this happens, the battery will not hold sufficient charge and will discharge very fast through the load. Equalization is done by giving slight overcharge to the battery even after the terminal voltage rises to maximum. Due to this overcharging, the weaker cells also get time to accept full charge. A fully charged 12 volt lead acid battery will show 13.8 V terminal voltage and a 12 V tubular battery will show 14.8 V in the fully charged state. 12 Volt battery used in vehicles is the Lead Acid (LA) type battery which can deliver more than 45 Ampere current to ignite the engine. It is the type of Starting battery or SLI battery (Starting Light Ignition) designed to give a heavy current to start the engine. 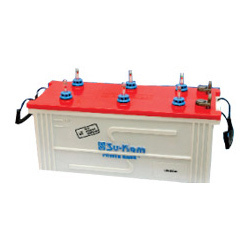 The lead acid battery is composed of series of plates immersed in a solution of Sulphuric acid. Each plate has a Grid on which the active material is attached. In the negative plate, lead oxide is attached as the active material while on the positive plate, pure lead is attached. All the negative plates are connected together and connected to the external negative terminal. Similarly all the positive plates are connected together and with the positive terminal. 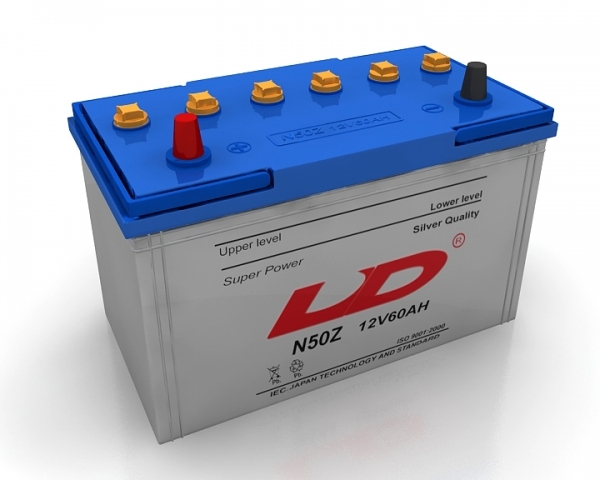 The electrolyte in the battery is sulphuric acid- water mixture which has specific gravity. The specific gravity is the weight of the sulphuric acid- water mixture compared to equal volume of water. Pure water has a specific gravity of 1. During the battery discharge, the sulphuric acid in the electrolyte combines with the active material of the plates. This releases energy and the plate material becomes Lead sulphate both in the positive and negative plates. When this happens, hydrogen atoms of the sulphuric acid combines with oxygen to form water. As a result, positive plates release electrons and the negative plates accept equal number of electrons. This creates a potential difference between the positive and negative plates and current passes through the load. During the charging and discharging process, heavy chemical reaction takes place which changes the specific gravity of sulphuric acid .This can damage the plates and may reduce the charging holding capacity. To prevent plate drying, topping with desired quantity of distilled water is necessary. A lead acid battery is composed of series of plates immersed in a solution of Sulphuric acid. This circuit reminds you when the battery enters into the deep discharge state. It always monitor the terminal voltage of battery, and activates a buzzer when the terminal voltage drops below 11.5 volts due to self discharge.This is an ideal circuit to monitor the standby battery which is charging occasionally. Sealed Maintenance Free batteries are widely used where minimal maintenance and space requirements are the main considerations. In UPS systems, it is used because of its maintenance free and eco friendly features. Here is a simple but useful battery level indicator to monitor the battery terminal voltage.Efficiency of the battery reflects in its terminal voltage. A good Lead Acid battery will show 13.8 volts in the fully charged state and if it is below 10 volts, the battery needs immediate charging. If the battery voltage goes above 14 volts, it is in the overcharged condition. This circuit uses a two lead bicolour LED to indicate three battery levels. If the voltage is below 10 volts, the Green part of the LED lights and if the voltage is above 14 volts, the Red part lights. If the battery voltage is between 10 to 14 volts LED remains off. Save your spare batteries from self discharge due to improper charge- discharge cycles. If you forget to charge the sealed lead acid battery for long period, it will not accept full charge during charging and its performance deteriorates. A solar panel can solve the problem and since it charges only during day time, over charging can be prevented .